THERE’S AN OLD SAYING that those who can’t do, teach, but Alison Diaz proving that to be nothing but a myth. Diaz, who was initially educated as a lawyer, was inspired to not only change her profession and become an educator, but to build better schools, especially for under-served communities in Southern California. Thus, Environmental Charters Schools were born, and their successes speak for themselves; in 2016, 97% of ECS high school students were accepted into 4-year colleges. The two middle schools and one high school Diaz founded are focused schools that feature STEM/STEAM programming, environmental education curriculum, and even have live animals on campus! Diaz spoke with Lady Clever about her vision for her dream charter school, the impact that a school environment can have on its students, and why she wanted ECS to be sustainable for kids and their communities. What led to your decision to pursue education as a career? What inspired you to found a charter school? When I was little you would often find me saying, “Life isn’t fair.” Whenever I found something unfair, I would have to do something about it. I went to law school to learn how to do just that but quickly realized I wasn’t solving inequities, so I left law and started teaching. I soon realized that through education I could make a difference – I could chip away at the problems most critical to our generation. All kids need a high-quality education. Kids in our most under-served communities, however, do not have high quality choices. So in 2000, we opened Environmental Charter Schools to address these challenges. Today, 98 percent of our students graduate prepared to enter a college or university and 97 percent are admitted. Why is it important to have the environment and sustainability feature so strongly in your schools? When students care about the issues they are studying and are moved to take action to make a measurable difference in their local community, they can see clearly that their voices are powerful. They realize they can do something about the problems and injustices they may be experiencing and seeing around them. They also start to realize that education matters, and that the academic skills they are learning can be immediately applied. Ultimately, they realize that they matter. Have the schools’ open environments and message centered on giving back impacted the students socially? Are there less bullying and self-esteem issues that you’ve noticed, compared to your former school? Yes. Our organizational values are evident as soon as you walk onto any of our campuses. ECS is a small learning community and our campus culture is reflected in our values – from how we treat and respect one another to our approach to learning. We are Family – We care. We communicate. We collaborate. We share. We are thought and change partners. We are Curious – We question. We explore. We innovate. We imagine. We are “solutionaries”. We are Sustainable – We grow. We adapt. We re-think. We thrive. We engineer progress. We are Leaders– We choose. We think critically. We advocate. We empower. We are our own superheroes. We are Accomplished – We learn. We focus. We excel. We shine. We get our hands dirty. Tell us about some of the interesting features you’ve incorporated into your campuses. Just steps away from the busiest, fastest freeways in Los Angeles, our campuses are alive, with more than 100 varieties of fruits and vegetables that serve as “free vending machines,” a living stream, school-wide composting, and solar-powered greenhouses. Our students take care of chickens, and in turn, learn patience and empathy that translates to every relationship. These outdoor spaces on our campus become real-world examples from which our students learn and make meaning out of the lessons once only taught from textbooks. Our students step into the living stream while taking a picture of nesting baby hummingbirds, while other students scrambled to reattach a chrysalis that dropped… all while watching a monarch butterfly emerge. At ECS, we ask our students to examine their own thinking about the scope of the environment. We have them think about environmental sustainability — waste, water, food, and energy. We then we ask them how this applies to the school as well as to their communities, and we challenge them to think about the role they play in effecting positive change. How do the schools incorporate STEM/STEAM programming into the curricula? Our Green Ambassadors program is an environmental education + STEM + service learning program that empowers youth to be agents of change in their communities, and to take action locally to make a measurable difference in their communities. The innovative academic program creates opportunities for students to develop leadership skills while addressing the critical environmental issues facing the planet and its residents. 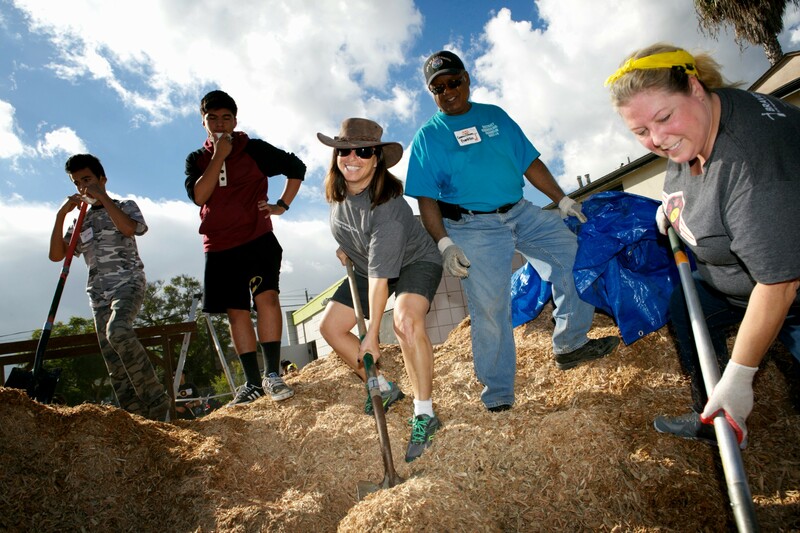 In the Green Ambassadors class, our students address the environmental issues of greatest significance to communities in Southern California using real-world, local issues to engage ECS and eventually other students. They then become green advocates and ambassadors by jumping into real-life environmental issues to find real solutions. In the more advanced Green Ambassadors Program, our students become interns. They work with local businesses and organizations to help reduce our collective environmental footprint through the implementation of sustainability audits, reporting on their findings and making recommendations for incorporation of best practices. These practices include diverting waste from the landfill through composting and recycling, gardening, rainwater catchment and conservation of natural resources. For the vast majority of ECS students, the Green Ambassadors program serves as their first introduction to “green jobs” and STEM careers. The GA program has become a model for environmental education and supports the dissemination of its best practices at schools and organizations throughout the state and nation. These best practices include: 1) fostering a common sense of purpose through a small learning community, 2) engaging students through an interdisciplinary rigorous college preparatory education, 3) utilizing environmental service learning to increase the relevance of school work, and 4) collaborating with community partners to provide an authentic context to learning. GA students are often called upon to serve as leaders for their peers and within their community on both environmental and social issues. 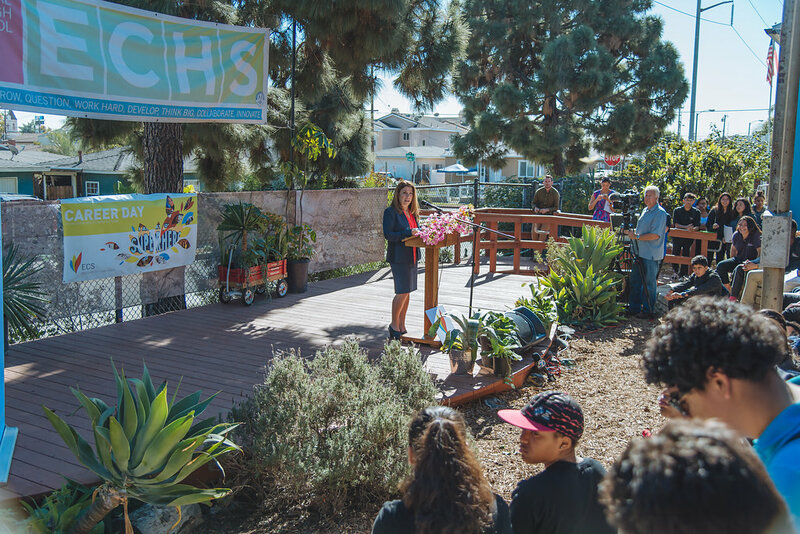 ECHS already serves as a demonstration site for its environmental education programs and practices and has disseminated its Green Ambassadors program to 10 schools within California, and continues to expand the environmental education learning space through the Green Ambassadors Institute. Why was it important for ECS to formulate its Green Ambassador Institute? The primary purpose of the Green Ambassadors Institute is to: 1) support educators to integrate principles of environmental sustainability within their standards-based core curricula; and 2) adopt environmentally sustainable, practices and programs in their classrooms, schools, and organizations. The Green Ambassador Institute has trained more than 200 educators from 60 schools to transform their instructional practices and the culture of their schools. The GAI teaches educators to utilize critical pedagogy to empower students to find authentic meaning in their academic studies. By sharing our best practices, we can further the impact of our change work. Our ultimate goal is school and community transformation — a strengthened sense of community, increased student motivation, higher student achievement and a reduced impact on the environment and climate change. What can communities do to help get charter schools like ECS in their area? Communities and individuals can take it upon themselves to learn more about public charter schools and our role in the larger public education dialogue. You can visit the California Charter School Association to find a school near you, or visit one of our schools by taking a student-led tour if you are in the Los Angeles-area. Come see for yourself! This is one teacher we can all learn from, no matter our age! To learn more about Environmental Charter Schools, visit their site and check them out on Facebook.